There is no question that fire pits are one of the most enjoyed outdoor items for any season (depending on your location and climate). Who doesn’t enjoy sitting out around a fire pit on a cool night, or toasting marshmallows over it during a picnic? Fire pits are a great addition to any home! However, you may be seeking out a fire pit that stands out with a comparable style to your liking. Luckily, Fifthroom.com has plenty of fire pits to choose from! Though there are many fire pits available, I’ve gathered a list of five fire pits that are sure to make your home stand out. Third Rock Fire Pit. This fire pit will bring out the geographer in you! 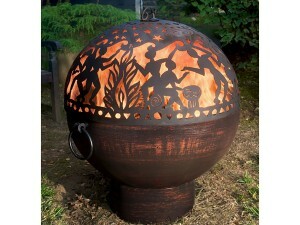 The Third Rock Fire Pit displays each continent on the globe in a silhouetted fashion . It is guaranteed to stand out to anyone who turns their eyes upon it. Manta Ray Fire Pit. 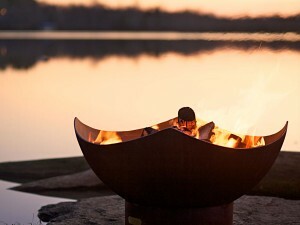 Seeking out a simplistic fire pit with a different shape to it? Then look no further! 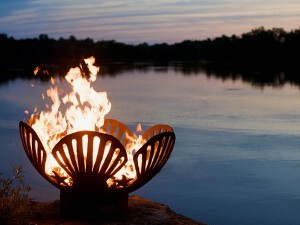 Our Manta Ray Fire Pit may be exactly what you want. This fire pit’s shape is inspired by the flowing motions of the Manta Ray, providing a smooth look that still catches the eye. Barefoot Beach Fire Pit. For all of you beach lovers out there, this is the fire pit for you! The Barefoot Beach Fire Pit is designed with sea shells and starfish wrapped all the way around it. Even if you don’t live near the ocean, bring the beach home with this fun, statement fire pit. Large Copper Bowl Fire Pit. Perhaps you’re more of a minimalist when it comes to your fire pit, but you’re still interested in something that stands out. 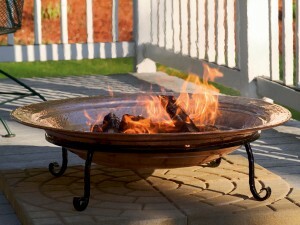 The Large Copper Bowl Fire Pit may be the ideal match for your style. Hand-hammered copper is a trendy and gorgeous way to show off your fire pit. Full Moon Fire Bowl. Different from the other fire pits listed, this fire bowl is sure to capture attention with its extremely detailed design. Handcrafted with supreme material and formed into an artistic piece, this fire bowl is sure to be an object of conversation while enjoying the warmth provided by it.